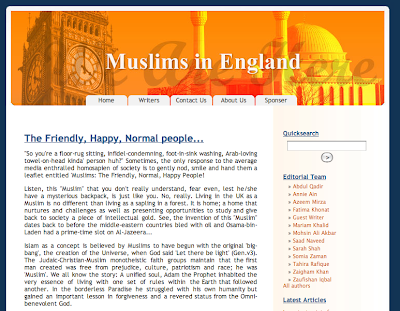 An extract from 'The Friendly, Happy Normal People' article I wrote for MuslimsInEngland.com. "Being “Muslim in England” is not a contradiction. There is no 'foreign land' to a Muslim. This whole planet and life itself is a short-lived stop at whichever country-station we are placed in. Allow us to be your guests, live to help you, live with you in England and may you learn that Muslims, true Muslims, are very humble, intelligent and logical people. Just like you." Read the rest on the MIE site here.